Gather important messages. Add important people to your VIP list, and their messages all appear in the VIP mailbox. Tap the sender’s name in a message, then tap Add to VIP. To show the VIP mailbox, tap Edit while viewing the Mailboxes list. Get notified of important messages. Notification Center lets you know when you receive messages in favorite mailboxes or messages from your VIPs. 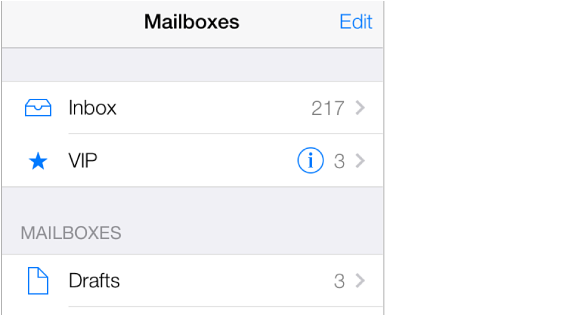 Go to Settings > Notification Center > Mail. Flag a message so you can find it later. Tap while reading the message. You can change the appearance of the flagged message indicator in Settings > Mail, Contacts, Calendars > Flag Style. To see the Flagged mailbox, tap Edit while viewing the Mailboxes list, then tap Flagged. Search for a message. Scroll to or tap the top of the message list to reveal the search field. Searching looks at the address fields, the subject, and the message body. To search multiple accounts at once, search from a smart mailbox, such as All Sent. Junk, be gone! Tap while you’re reading a message, then tap Move to Junk to file it in the Junk folder. If you accidentally mark a message as junk, shake iPhone immediately to undo. Make a favorite mailbox. Favorites appear at the top of the Mailboxes list. To add one, tap Edit while viewing the Mailboxes list. Tap Add Mailbox, then select the mailboxes to add. You’ll also get push notifications for your favorite mailboxes.